Please share your experience with others, send us your recipes and we will place them on this page. Thank you! Ingredients: 1-2 cups sprouted, mixed Beans and Lentils. 2 stalks Celery. finely chopped. 3/4 purple Onion, diced small. 1/2 yellow, orange, or purple. 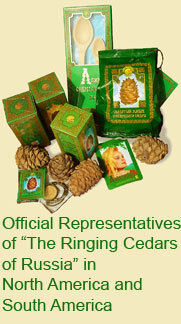 100g "Ringing Cedars" Pine Nuts. 1 Pepper, finely chopped. 1/2 Red Pepper, finely chopped. 1 Green Onion, finely chopped. Directions: Dice all above ingredients (except Pine Nuts) and mix together in a bowl. Add marinade below and set in fridge overnight to blend the flavors. Best served with Pine Nuts. Whisk all dressing ingredients together in a jar with a lid. Pour 1/2 of the marinade over the bean salad and let marinade in fridge overnight. Save the rest of the dressing for the next time. Directions: Cut Avocado and put in blender with Lemon Juice. Blend until smooth. Add rest of ingredients and blend until smooth again. Put in salad or use as dip. Directions: Toss 2 cups sprouted Beans and Lentils with Onion, combine Lemon Juice, Garlic, Curry power and salt together and pour over top mixture with Beans and Lentils. Sprinkle with Pine Nuts or mix them in. It can be served as a tasty lunch salad or you can stuff a Red, Yellow, Orange or Purple pepper with it. You can also stuff a Tomato and an Avocado half with it. Enjoy! Directions: Combine all above ingredients except tomatoes. Mix well. Cut tomatoes in half crosswise and scoop out insides, which you can save for tomato soup. Fill each half with combined ingredients. Serve on Lettuce leaf. Directions: Mix all ingredients together, spread on top of any crackers and sprinkle with Pine Nuts. Ingredients:2/3 cups oatmeal,1,5 cups water, 1 pear, washed, cored and chopped coarsely, 1/4 cup pine nuts,3 tbsp maple syrup or honey,1 tbsp pine nut oil.